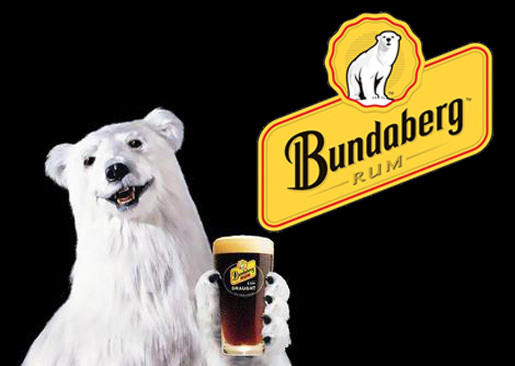 a href=”http://www.bundabergrum.com.au”>Bundaberg Rum, a product of Queensland, Australia, has a polar bear for a mascot, Bundy R. Bear. Bundy has starred in a number of television advertisements in which Leo Burnett, Sydney, connect the brand’s labels with a larrikin approach to Australian mateship. The ads have successfully moved the brand from being mostly an iconic shearer’s drink to the rum preferred by a wide range of young blokes between the ages of 18 and 35, particularly those who follow Rugby Union football. Bundaberg host a range of the TV ads on their site: www.bundabergrum.com.au, in SWF format. In “Drop Bear” the blokes are on a fishing and camping trip. As they sip on their classic Bundaberg Rum and Cola they notice three blonde women have set up their tent next to the water. “I wouldn’t camp there if I were you”, says one. “There’s drop bears”. “Drop bears?” “Yeah they’re like a bigger mean version of koala bears. They drop from the tree and then go for your head…” Just before the boys push the story too far Bundy falls out of the gum tree and flattens the girls’ tent. The girls run off past the guys. The next scene shows the whole group sharing a drink in the evening. The next two were released in September 2004, developed at Leo Burnett, Sydney, by creative director Nick Souter, art director Katie Manekshaw, copywriter Trent Christie, group account directors Nick Williams and Anita Zanesco, account manager Nick Barnett, planner Susanna Dowling. Production staff at CIF Productions included producer Helen Hendry and director Matt Palmer. Media strategy and buying were provided by Mindshare. In “Valentines Day” the blokes are under pressure to take their girlfriends out for dinner but they’re keen to watch the rugby. Bundy Bear comes to the rescue, inviting them round to dinner at his place. On the night everything looks very romantic, with candlelight, red roses and glasses of wine. As the women talk about hair and clothes, the men ooh and ah, captivated by the footy on the screen behind the women. In “Inflatable” three blokes packing gear for a fishing trip on their inflatable raft when they are impressed by a passing boat load of girls. “Nice boat!”. Once they’re out on the water Bundy Bear pulls out a hook and punctures the raft, bringing on the need for rescue by the female sailors. In “Chopper” two blokes sit down and pull out a bottle of Bundaberg Rum Dry and Lime. As the bottles reach their mouths icy water falls out of the sky, totally drenching the men. “That was refreshing”, says one. “Yeah! Thinks it’s the lime!”, says the other. Up in the sky, Bundy R. Bear is flying a helicopter, laughing with satisfaction. A bottle and can of Bundaberg Rum Dry & Lime appear with the super: “Surprisingly Refreshing Taste”. Adam Stevens, director via Silverscreen Productions, worked on a number of spots highlighting Bundaberg’s sponsorship of the Australian rugby union team, the Wallabies. In “Goats” the blokes are trying to sort out an overgrown yard. Clearly the boys can’t watch the game until the job is done. Bundy turns up with some fairly heavy equipment, a truckload of goats. ” You ready to get into it?”, he says. In “French Lessons” Bundy’s in an Australian bar giving instructions on how to relate to the French rugby team visiting Australia. “You’ve pulled off a big head”, says Bundy, pointing to the board. “Yeah bienvu a Australia,” say the men. (Text: Welcome to Australia), “You’ve stolen the ball”, says Bundy. “Merci Beaucoup” say the men (Text: Thanks Mate). Bundy gets the men to repeat “Merci Beaucoup” with the right emphasis. “Tres bon fellas”, he says. In “Goose Step” guys in a nightclub watch another man dancing away, asking “what do you call that?” Bundy Bear calls it the Goosestep. In “Ice Bucket” Phil Waugh, one of the Wallabies, gets in a tub of ice-cold water after a game, only to find a six pack of Bundaberg and Rum cans. Bundy Bear says, “Sorry Phil”, takes the cans and hands them over to Stephen Larkham. “Oh Stevo!”, he jokingly scolds. In “Stripper” Bundy turns up at Macca’s Party, at 4 Acacia Ave. He’s welcomed in to meet the waiting guests, women expecting a stripping fireman. The blokes wonder what’s happened to Bundy. Bundy’s told to take his top off. “Sure”, he says, ripping the top off his bottle of Bundy Classic.